Belváros. Downtown. The Inner City. Where it all comes together. The Queen of Budapest Districts. It’s all here: District V – Budapest at its classiest. Budapest’s District V, also known as Belváros, is one of the smallest in size, but probably the most important in the city. Belváros. Downtown. The Inner City. Where it all comes together. The Queen of Budapest Districts. It’s all here: District V – Budapest at its classiest. Budapest’s District V, also known as Belváros, is one of the smallest in size, but probably the most important in the city. The district is home to the crown jewels of Hungarian architecture, the beautiful neo-gothic Hungarian Parliament building and Saint Stephen’s Basilica, along with many government ministries and five-star hotels. Check out our guide of the real off-beat Budapest district VIII! District V hosts the administrative center of Budapest. During the Roman era a fortress, Contra Aquincum, stood in the area, the ruins of which can be seen today at Március 15 tér. In medieval times Pest functioned as the outskirts of royal Buda, but the settlement quickly developed into a flourishing trade city on its own. King Matthias made Pest an independent royal city in 1468. The city wall was built during that time, following the line of today’s Deák Ferenc utca-Károly körút-Múzeum körút-Kálvin tér-Vámház körút. The roads leading in and out of Pest city were guarded by six gates. The development of the city was interrupted during the Turkish rule. It started to revive during the 18th century, when the city walls prohibiting large-scale development works were demolished or incorporated into later buildings. Duna Korzó, the Danube Promenade, was formed towards the end of the 18th century when the so-called Újépület, or “New Building,” was built on the site of the present Szabadság tér. The area between Újépület and the former inner city was named Lipótváros after King Lipót was crowned in 1790. In 1897 Újépület was pulled down and Szabadság Square (Freedom Square) was formed. Kossuth Lajos Square, with its magnificent Parliament building, was also created during these years. Szabadság tér is part of a large-scale project that was refurbished during the creation of Budapest’s New Main Street, Új Fő Utca. This new, partly pedestrianized area now runs between Kálvin tér and Szabadság tér. The aim of this project is to create a lively, pedestrian-friendly Main Street in the inner city with benches, terraced cafes and restaurants to stop for coffee or lunch and with much less traffic. The second part of the project included the refurbishment of Ferenciek tere. Today Szabadság tér is a lively place with lots of cafés and restaurants. The Soviet War Memorial dominates the northern end. A unique interactive fountain is the highlight of the refurbishment program at the southern end of Szabadság tér, a nice offset to the rigid stone monument. The famous pedestrian shopping area, Váci Street, cuts through the district, with the Great Market Hall at one end and Vörösmarty tér at the other end. Vörösmarty tér is a popular venue for events, like the Advent Festival & Fair from late November till January, or the Sweet Days Festival in September. This well-known square also hosts Cafe Gerbeaud, another Budapest institution, along with the Fountain of Nereids. 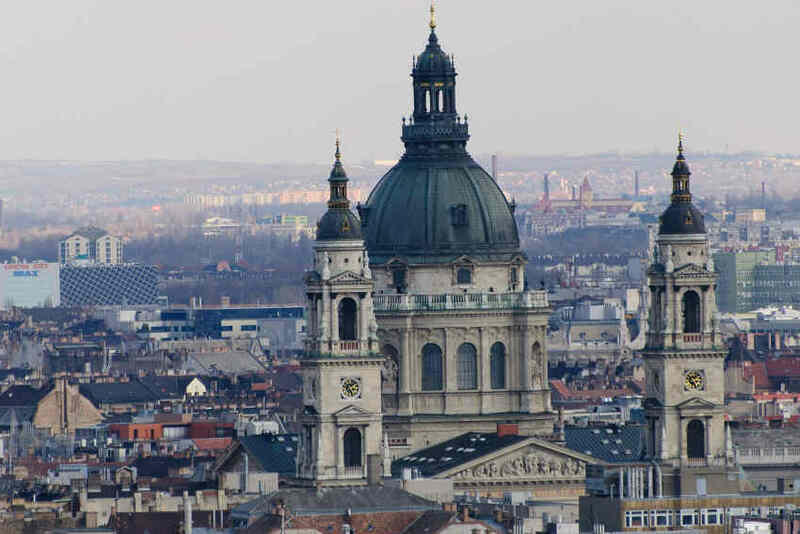 And there’s even more to see and do in District V. Budapest’s biggest church, St. Stephen’s Basilica, also stands in this district, at the end of a lovely plaza lined with trendy cafes and bistros. Historic Pest was here and you can even see remains of the city wall in Kecskeméti utca. You can take a relaxing stroll along the Dunakorzó (Danube Promenade) and enjoy the beautiful vista of the Danube and Castle Hill. The city center of Budapest also has many eateries, including gourmet places like the Michelin-star Onyx (part of the Gerbeaud House) at Vörösmarty tér. Tram No. 2 runs along the Pest side of the Danube and is perfect for city sightseeing. District V boasts many Five-Star hotels, some of which utilize great locations and the beautiful panorama of the Danube and Castle Hill. Lipótváros is also a business quarter with several major banks, government ministries and offices that flank the grandiose Budapest Parliament on Kossuth tér. This is the heart of Pest and is embraced by two bridges, the Chain Bridge and Liberty Bridge, and also includes Deák tér, where three of the four metro lines converge. Feature image by Zoltán Pelle.